While most Chrome users have been upgraded to Chrome 10, Google is fixing the bugs from Chrome 11 and working on Chrome 12. A recent Chromium build made a significant change: Gears is no longer included in Google Chrome. Gears is a browser plugin released by Google back in 2007, The initial goal was to add support for offline web apps, but the plugin added many other HTML5 features at a time when HTML5 wasn't a priority for most browsers. Google discontinued Gears last year to focus on "bringing all of the Gears capabilities into web standards like HTML5" and to implement them in Google Chrome. Features like geolocation, notifications, web workers, application caches are already available in Google Chrome, so it's probably the right time to stop bundling the Gears plugin. "With all this now available in HTML5, it's finally time to say goodbye to Gears. There will be no new Gears releases, and newer browsers such as Firefox 4 and Internet Explorer 9 will not be supported. We will also be removing Gears from Chrome in Chrome 12," informs Google. 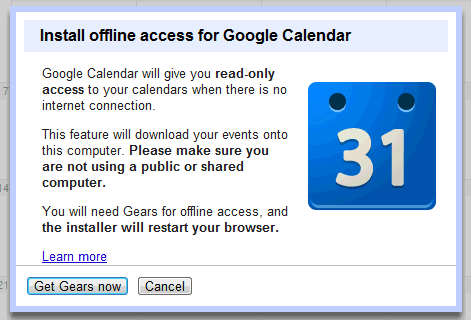 What's surprising is that important services like Gmail and Google Calendar still use Gears to work offline. Other services like Google Docs and Google Reader dropped offline support last year. Google promised that they will use HTML5 features implemented in browsers like Chrome or Firefox, but that hasn't materialized yet. Looks like they'll be using HTML 5 application caches to replace the Gears functionality in GMail and Calendar. Just to be clear, does this mean chrome 12 will support offline google apps like gmail and docs? That would be very exciting news! That means that i will be able to use it on my mac. I'm sure they will fix that soon. No, this means that the features that require Gears will no longer work in Chrome 12 (to be available in May or June) and in the following Chrome releases. Offline Gmail and offline Google Calendar will no longer work in Chrome until Google updates the two services and uses HTML5 app caches. May be both service will overhauled redesign and rebuilt with HTML 5 and shown off at google I/0, which is early May I believe, which fits in with the Chrome 12 release date. Believing this almost implies also believing they will launch Google Earth Plugin for Linux by the time the first Chrome OS devices launch. (Or its functionality is finally ported to O3D/ WebGL). That and Cloud Print and Remoting. I do in any case. That they're that well-coordinated a company, I mean. That the "beehive culture" they operate under also implies making sure your team's product works under/for/with the product/platform of your friends'/former teammates' teams (so the big ones, with big teams and the most cross-team contact, first and foremost). That said, opening .docs, xls's or .ppt's in Google Docs in Chrome isn't possible by double-clicking files, as has been possible for a long time with Google Toolbar for Firefox. So maybe not always. 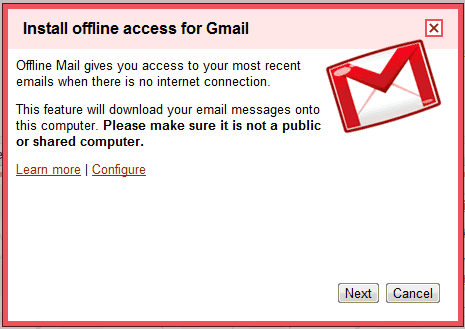 I'm actually quite worried about the offline Gmail feature going away. I'm traveling extensively and offline Gmail is not only essential for my being able to download E-mail and process it while off the net, but also because the flaky connection mode it provides is critical for poor connections I often encounter in remote locations. I REALLY hope they get a suitable replacement working for HTML5 FIRST! Just use a mail client :) Webmail (Gmail) IS made for online usage. Actually I was *not* talking from much experience of the US: I have only spent a few days there in my live, in major cities. I spend most of my time in developing countries. But even in rural England, where my parents live, the broadband connection is so slow that Gmail often fails to load. Gmail currently *is* an offline mail client. It will be a step backwards to go back to Outlook or similar: the conversation view and the search facility are major advantages of Gmail, even when working offline. Oops, that should be "... in my life". I'd feel much happier about them dropping all this support for Gears if they _already_ had an alternative system not only built, but in operation. Isn't that usually the way it works? I'm not a fan of Chrome because it was not an SEO-friendly browser. I prefer Firefox although Firefox is updating now into Firefox 4.0 which is looks like Google chrome but Firefox SEO addons is still there. If this means that HTML5 versions of Offline Gmail, Calendar, Docs, etc, will be ready to go, then this is great. If not, it's really terrible news. The Google suite could be a fantastic Personal Information Manager if only it worked well offline. I hope Google's strange neglect of offline functionality will come to an end. This IS sad. Used to the great service of Google Offline, I upgrade to Firefox and lo and behold - every thing's gone! I don't have perpetual connectivity and used gmail as a great storage device. I wonder if major development is happening in India, where I reside and where such a service is critical. I've posted on the Mozilla and Google forums to try and get some idea when the HTML5 functionality will be available but no joy. Everyone seems to be in the dark on this...it seems crazy that Google haven't prioritised getting this ready for the launch of FF4. Maybe (for FF at least) add-on developers will come to the rescue. Google and Mozilla have hammered out an API already so it might be possible to do. "I don't have perpetual connectivity and used gmail as a great storage device. I wonder if major development is happening in India, where I reside and where such a service is critical." Google doesn't seem to care much about offline capability. I think the problem is that they exist in an environment of always-available service, so they aren't aware what reality is for the 95% or so of the world's population that doesn't have such reliable service. i find this quite perplexing, i use gmail and google docs quite often on the train where connectivity is limited, and gears is a life saver. i can see why they may be phasing it out with HTML5 now becoming more supported, but come on guys, sort out yer own products first!! I have just migrated almost my entire site to Gmail - but offline access is important because I'm always flying. Guess it's back to Outlook. What a complete screwup by Google. Google please think twice before killing this. Everybody who uses gmail for business communications (i.e. most paid googleapps users like my company) need offline to work on their email while disconnected. Please do not force us to buy Office just cause we need Outlook now. You can use Mozilla 3.6. Had to downgrade from Firefox 4 to 3.6 so that I can use Gears in there for my offline mail. Forced to use Office? Use Thunderbird.